I've always been a bookworm. There's nothing quite like cosying up on a Sunday morning with a brew and a good book, getting lost between the pages, escaping the real world for just a few moments. I get so lost in books at times, and sometimes, it's the best place to be. Danielle tagged me in the Lost in a Book tag, so let's get a little lost together, shall we? Usually curled up on the couch in the living room. We have a huge two storey window in there so the lighting is pretty good and it’s super cosy! I can pretty much read anywhere but I love reading in libraries. Liverpool Central Library has a section called the Picton Room. Google it, it looks like the library from Beauty and the Beast. Easily one of my favourite places to sit and read. My current bookmark is a Rowena Ravenclaw chocolate frog card! So I guess that’s half random, half bookmark? I’ve got some amazing jewelled bookmarks from my parents but they’re too bulky and always end up falling out and losing my page! I can stop wherever but I prefer it to be at the end of a page or paragraph. If a book has really short chapters though I will always try and get to the end of the current chapter. Mostly drink. But you’re likely to find biscuit crumbs between the pages too! Both. I love my e-reader for it’s portability, especially when travelling or commuting. And when I decide to read a tomb of a novel, it really helps me to not break my back when lugging it around. That being said, I love going to the library and getting my hands on real books, the smell, the touch, other people's notes and crumbs, there’s someone's untold journey between those pages. Music sometimes, but it can’t have any lyrics otherwise I find it too distracting. I love listening to classical music when I read, they go so well together. It also helps drown out any noise if I’m reading in public. I used to read several at once. I would have a commute/work book and a book by my bed for evenings. This really helped when I was studying as I had so much to read but more often than not these days I'm a one book kinda woman. I don’t commute to work anymore so I’ve lost a good 60-90 mins of reading a day so it takes me a lot longer to finish one book these days, let alone two! Everywhere. Unless I’m on a night out, you’ll always find a book in my bag. Most of my reading is done at home, there's less distractions but I do try to read in work if I’m alone on break etc, it’s a great way to escape a bad day at work! Both. Kind of. Mostly I read in my head, but when I’m home alone and reading I often find myself whispering the words. It comes from when I was younger, I was always chosen as the reader in plays so I had to practice pronunciation and emphasis out loud. I really will read anything and everything, it all depends what I’m in the mood for. I couldn’t choose one over the other. If I’m getting impatient I might glance to the end of the page before I start reading it to see where things are going but I’ll still read the entire page. The only pages I’m ever likely to skip are the epilogue pages from the last Harry Potter….I just can’t read those…those….things! Spine breaker! I really freak out when I borrow a book from a friend and the book is so pristine I have to ask if they’ve actually read it. I can’t be that careful with books and I hate it when I’m trying to read on my lunch break and the page keeps turning itself back over! I believe books are meant to be loved, used, have the spines broken and the corners of pages turned down. There should be crumbs and annotations, it should look like it took its last reader on a journey. Not so much these days but when I was studying, every book was covered in pencil notes, ideas, highlights, and questions. I’m not against writing in book's though. I love it when you pick up a library book and see someone else's underlinings, I always wonder why did they underline that particular thing, what were they thinking? What did it mean to them? 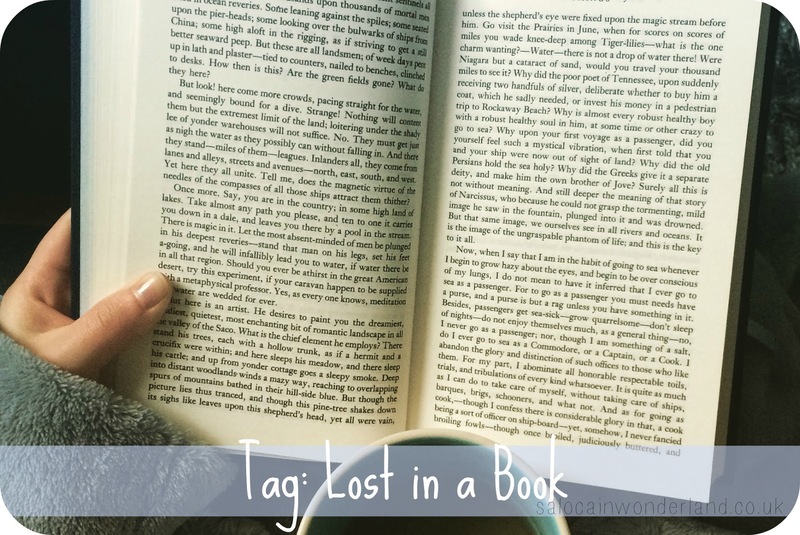 I wrote a post on books I could read again and again but the list is even longer than that. If I could only take one book to a desert island I just don’t know what I’d choose. So many are so important to me - I’d have to take my Kindle so I could fit them all on, and a solar powered charger of course! Welcome! Glad you enjoyed the tag! I wish I could read more to be honest, not summating has it's perks but I don't get to read half as much as I used to! There's just not enough hours in the day! What a fun tag!! I'm a big reader and it was fun to answer all the questions along with you in my head! :) I'm bad about reading more than one book at once- I have my commute book, an audiobook I listen to when I walk on the treadmill, and I have a daily calendar that will have you read Pride and Prejudice by the end of the year! Wow! That's a lot on the go at once! I love the idea of an audiobook for when I'm in the gym but the music in the gym is SO loud I can't hear anything through my headphones! I think if I can get some total ear covering ones then I might be able to start doing that too! I'm a spine breaker too AND I always skip ahead haha. But if you skip ahead you could miss out on something REALLY good! haha! Yes to spine breaking!